When A Pet At Dies At Home, Here's 8 Things You'll Need To Do! When A Pet Dies At Home, Here’s 8 Things You’ll Need To Do! If your family’s beloved pet dies suddenly at home, would you know what to do? If not, you’re not alone. People ask “what to do” on a regular basis. Here you will learn 8 things you’ll need to do, in order to properly handle the situation. When we make the decision to bring a pet into our home, the majority of us do our homework. Topics of conversation and planning revolve around house breaking, cage training, socialization and overall behavior. Unless you adopt a senior dog or one with a disability, rarely does the topic of pet death ever come up. For the next few minutes we’ll review the necessary actions that every pet parent or owner should know when their pet dies at home unexpectedly. First and foremost, as strange as it sounds, make sure the pet is deceased! 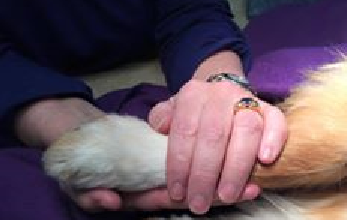 All too often, people think their pet died, only to discover that they are still alive. This is because they are breathing very shallow and lying still. Most likely they are transitioning and death is near. Don’t be afraid, this is normal. (Note: If your feel the pet is in distress, you may want to think about euthanizing. Please call your vet clinic, they can answer your questions. If you were planning to let them die naturally, keep the area calm and quiet). After a pet dies, typically their bowls will release. This may not happen immediately. (If your pet is dehydrated or hasn’t eaten, this may not occur.) Don’t be alarmed, just be prepared as nature is simply taking its course. If your pet is lying on the floor or a piece of furniture, you’ll want to place some a towel or even plastic under their hind end immediately. If there are other pets at home, let them smell their friend. By allowing this to happen they will understand what happened to their buddy. Otherwise, they will wonder where they went. Your pet will know naturally what to do. Should they act aloof, its alright. The scent of the deceased pet is what the living pets need. This can be accomplished by being in the same room. A decision will need to be made to either bury or cremate. Some people want to keep their pet at home for a day, until they decide what to do. If you want to do this, place your pet’s remains in a container. Why? Without being placed in cold storage, the pet’s body will begin to decompose (this presents a health risk!). One stage of this process is known as rigor mortise. This is when the energy supply to the pet’s muscles deplete. When this occurs, everything becomes stiff. The average time for “rigor” to set in is 3-4 hours and its typically complete within 12 hours post death. Depending on the position your pet was in when it died, you’ll want to tuck their front and back legs tight into their body (known as positioning), rather than leaving the pet outstretched. Why? Primarily for transportation and burial reasons. If you want to transport you pet, place them in a container or even wrap them up in a blanket. When their limbs are not properly positioned they are awkward and difficult to transport or place in a burial container. If you bury, you’ll want to follow the city or township’s ordinances. Should you choose to cremate, you’ll need to make arrangements for your pet’s transportation to the cremation provider. If you come home and your pet died while you were away, you’ll need to attempt to figure out how long the pet has been deceased. If rigor mortise has set in, you’ll know it was at least 3 hours. Depending on the time of year, if its warm outside, you may have an odor that could be difficult getting out of your carpet or even floor. Don’t try to remove this smell out of your carpet/floor yourself, consult a professional. In the long run, it will be worth it. In closing, the loss of a pet is never easy. It’s especially hard to remain calm and think through what to do if it’s a sudden onset illness or accident. Finally, keep in mind it’s okay to not know what to do. For most of us, we’ve never walked this journey before.